“Much to my surprise I can’t really fault your theory. You are probably educationally right; certainly your argument is ethically correct. But the system you’re arguing for would require very good teachers. We’re not convinced that there will ever be enough good teachers. So, instead, we’re going for a teacher-proof system of organising schools – that way we can get a uniform standard”. JR: That’s quite a shocking statement – so what did you conclude from that meeting? JA: These words have returned to haunt me time and again in the subsequent 18 years. It is far too easy for educational objectives to be subverted to more immediate political objectives.Running through everything the Initiative had done since 1985 there was a very obvious tension between those who wanted to understand the Design Faults that were impeding the development of English education, and those, seemingly increasing in number, who wanted to come up with quick political solutions that could be imposed from Westminster. JR: From what I have seen in my time with the Initiative, it has been clear that you and the trustees place great value in equipping people to hold our politicians to account. Specifically, to so improve the general level of understanding of society at large, that people would understand when policymakers move too far away from what brain science increasingly tells us about the way humans learn, and you have called ‘the grain of the human brain’. But, the Initiative has been calling for quite a significant shift in both thinking and doing. Given that you have worked as a teacher and a head teacher, how did you come to be calling for such radical transformation? JA: Well, strangely enough, I never intended to become a teacher. I just loved organising expeditions for the young people up to the Hebrides in Scotland, but this links directly to the origins of what would become the Initiative. My thinking then was that youngsters are inspired when they are out doing interesting things, which are so often nothing to do with lessons in school buildings, and so when I became a teacher I was instinctively thinking about how formal education could be broadened to include the role of informal learning. JR: wasn’t there something that started even before that? JA: Yes, I found the study of Latin at school very difficult because my teacher was himself so bored with the subject that he spent every lesson telling us about his exploits in the army. I was so bored that I failed Latin ‘O Level’ three times, and would fail to get to university if I didn’t pass it at the fourth and final attempt in 6 weeks time. At that very moment the school carpenter took me to one side to congratulate me on being chosen to represent Great Britain at an international exhibition. Excited as I was about this the school took absolutely no notice as this was not apparently of the same status as a rugby result or a formal examination. I took to rationalising the situation and quickly recognised that I was good at carving because I was directing myself. That lunch time I told my Latin teacher that because I had only six weeks to pass the exam I would not come to any more lessons but would teach myself. I suppose that was an act of utter rebellion because in the mid 1950s well-behaved schoolboys didn’t do that. With everyone thinking me foolish I set out and worked harder than I have ever worked in my life. I went into the exam with my mind loaded and when the results came out I found I had the highest mark that anyone from that school had ever got for Latin… But within a few months I had forgotten it all, but I had played the right game and went to university. For students to succeed they have to learn to take responsibility for themselves, so to me as a young teacher, success at leading expeditions, or woodcarving, prepared me for a life of direct personal responsibility. JR: and how did this idea of having responsibility for your own learning translate into your work as a teacher? Very directly, and in a curious way. I have never had good hand-writing, and I was never good at spelling, so I just had to get by. I hated having to re-write an essay (why do we spend so much time re-writing?). Now, when I was a head teacher, I saw my secretary using one of the very first electronic typewriters, and I realised the potential. Wouldn’t it be magnificent, I thought, if children could type on a computer, because they could draft and re-draft their material. That was quite a radical idea at the time and so I established what was to be Britain’s first fully computerised classroom, in which every child would have access to a computer. JR: How did the introduction of such revolutionary technology impact your school all those years ago? JR: Looking back, the potential to draft an answer presented a significant challenge to how things had been done before. JA: This was an apparently simple question, but one that drives to the very heart of schools’ institutional practices. Is/should learning be a collaborative, or a competitive activity? Or is it both… and how should that work? JR: So, what did you do? How did you respond? JA: I felt that this question challenged some of the fundamental assumptions of assessment, and so I phoned The Chairman of the Cambridge University Examinations Board for his advice. “It’s an interesting question”, he replied, “because as a University we have made a good living over the past five centuries by, in effect, examining students’ first drafts. Now you are suggesting that this new technology, by replacing pen and ink with a device that seems to some of us to ‘artificially’ enhance a student’s performance in ways which often seems like cheating. This poses very serious questions for the entire examinations ‘industry’”. He paused before eventually saying, “I think we will have to wait for the Government to instruct us”. JR: you mean he didn’t accept any responsibility and preferred to simply wait for a government instruction? JA: No, and I think this gets to the nub of the issue. There was, for Cambridge, no intellectual answer to this conundrum to the extent that the solution was not to work out what the response might be, but was to wait for a political answer, and to be led by the politicians. The decision over assessment was acknowledged to be political; not an intellectual, or pedagogic, decision, but a political one. JR: So, the intrinsic connection between education and politics was, in this case, plain to see, and it was a relationship shaped and led by the politicians rather than the educationalists. Was that a surprise to you? JA: This really is the crux of the matter. A functioning democracy is forever contingent on the education of its young people in the way that John Milton described. What shook me was that the educational professionals of the 1980s had lost the zeal of those 20 or 30 years before who really believed that their job was to equip us to lead a truly democratic society. The professionals were being led, and were comfortable being led, by the politicians. And I see this need for a political answer as something that has never been fully resolved in England. JR: Is that the case just in England, or elsewhere too? JA: Fortunately there are exceptions. When we look overseas, Jeff Hopkins, working in British Columbia, Canada, is a rare example of someone who believes the opposite is the case, that instead of waiting for a political answer, it is the intellectual, pedagogic insight that galvanises action. His approach, most recently visible in the founding of the Pacific School of Innovation and Inquiry in 2013, has pupils responsible for creating and developing their own projects and timetable, both on their own and collaboratively, in ways that will meet, but not be constrained by, the various outcomes necessary to progress through the Canadian education system. In his approach, as in that of the Finnish education system, the teachers’ skill, innovation and training are paramount. Their ability to adapt and identify what is needed for each child in each case, brings a level of ownership and responsibility that makes it possible for such a system to create the space for children and young people to become autonomous, innovative and adaptable learners. JR: This sounds like a significant shift not only in how the learning process is understood, but also in the role and configuration of schools as part of that process. JA: There are two analogies, which I have used to describe the current situation we face and point to this paradigm shift. They are helpful in illustrating the significance of the change that is happening around us. During the Second World War, the US government was impressed by the performance of the two Cunard liners the ‘RMS Queen Mary’ and the ‘RMS Queen Elizabeth’, which each transported thousands of troops so fast that German U-boats were unable to catch them. Once the war was over, the American government subsidised the private building of a passenger ship – the ‘SS United States’ – that could go faster and in time of military need, carry even more troops than its British counterparts. The ‘SS United States’ finally entered service as a commercial liner around 1959. At a speed of nearly 40 knots, she cut the travel time from New York to England to just 84 hours. I sailed on her once, and she was a lovely ship. Three years later, however, she started to lose money, and recorded a loss for every year thereafter. After just ten years she was mothballed, hauled off to a Turkish port, and lay there rusting for a quarter century. Why the sad demise of this grand ship? Because the DeHaviland Brothers had pioneered a commercial jet aircraft, The Comet, and British Overseas Airways Corporation had started flying passengers across the Atlantic. The jet airplane cut the travel time from 84 to just eight hours. The days of the great trans-Atlantic liner were over. There was nothing wrong with the design of the ‘SS United States’. JR: So, essentially you were saying that the rules of the game had changed? JA: Indeed so, she was simply overtaken by a totally new form of technology, which opened up more opportunity for more people at lower cost. Exactly, this sense of game-change is captured in another analogy. Long ago in 1927 Mercedes Benz produced 1400 cars. With amazing long term vision the directors called for a Report on the Company’s growth potential over the next 50 years. Back came the Consultants’ Report…so quick would be the growth in technological knowledge that within fifty years the Company could be producing 40,000 cars a year. The directors were appalled at the consultant’s naivety…for self-obviously it would be totally impossible for the schools ever to train 40,000 chauffeurs a year! JR: John, so what you’re really saying is that we’re stuck in a system that is not of our time – that our politicians and policy-makers haven’t transformed the model of schooling to reflect what we know about how children learn and the shifting social and cultural context in which we live? JA: Yes, it is why I started talking ten years ago about an ‘overschooled but undereducated’ generation. This current obsession with a ‘teacher-proof’ system is never going to produce what our young people need.. I mentioned the Finns earlier as an example of a country that has undertaken radical transformation, from a comparable position of England in the 1950s, to become one of the most effective education systems in the world, however it is measured. Pasi Sahlberg, one of the architects of this achievement, refers to PISA’s Andreas Schleicher who suggests that one element of Finland’s success has been “the capacity of policy makers to pursue reform in ways beyond optimizing existing structures, policies and practices, and moved towards fundamentally transforming the paradigms and beliefs that underlay educational policy and practice until 1960s”. JR: We will discuss the Finns more later in this piece, for their approach to the education of their young, especially in light of the English situation has much to contribute to our debate. Both their and Jeff’s inspirational examples seem a million miles from any notion of a ‘teacher-proof’ system of education, yet we in England continue to have our education system shaped and engineered by our politicians, and this doesn’t seem to have given us the system many of us want. JA: I have taken very seriously the need to influence and educate those making decisions about our whole system of schools, and the expectations we have about those schools and the work that they do. Of the hundreds of lectures I gave to audiences throughout Britain, and many in other English-speaking countries, I well remember Addressing a meeting of Head teachers and others in Harrogate, Yorkshire (November 2008) on the themes of ‘Overschooled but Undereducated’ – thattoo much schooling does not equal good quality education and learning – I made that point very powerfully. I had not known that sitting in the audience was Dominic Cummings, a man I did not recognise. He came up to me afterwards to say he was fascinated in what I had said as he had been appointed the previous day as Special Adviser (SPAD – an increasingly influential group of non-elected individuals, introduced by new Labour) to Michael Gove the Shadow spokesman for Education… I knew nothing about his background, but was impressed by the urgency of his questions, and agreed to meet him in London the following day… This was the beginning of a saga which has now lasted more than 6 years. JR: With hindsight, and given everything that has happened since, that must have been a pretty significant meeting? Just after that I had produced the important paper ‘Adolescence: a Critical Evolutionary Adaptation’. This gave a neurobiological explanation for why the brains of teenagers have evolved to be much more involved with things which they take personal responsibility for, rather than simply being told… an understanding that goes right back to Confucius but which modern England seems to have forgotten. This was the most heavily copied internationally of all the papers I have ever written and really did change people’s attitudes away from adolescence as a problem to a critical opportunity. It was a rich time in terms of research and writing and we at the Initiative were eager to have an impact on those shaping our education systems. So, to meet with Cummings, someone who would potentially have significant influence, was an exciting opportunity with enormous potential. JR: So when it came to your first meeting with Cummings, what did you talk about? JA: Given all the adverse comments made over the last 18 months about Cummings (including allegations of bullying and intimidation within the Department of Education, very public spats with other MPs and ministers, the use of personal email for departmental business to circumvent FOI requests and other scrutiny…), I found my extended conversation with him over about a six-month period extremely helpful and stimulating. Rather than pushing a specifically Conservative Party agenda, Cummings argued (and I believe he was genuine) that what was needed was a powerful public statement setting out the deign faults at the heart of English education. I threw myself into the writing of this and, checking back on our records, we exchanged in excess of 50 emails. In 2009 the Initiative sent copies of this document to every Member of Parliament and to all the Directors of Children’s Services that we could find across England and Wales. JR: This briefing paper not only laid out a comprehensive account of how English education had come to be in its current predicament, but it also made concrete recommendations on how to move forward. the critical importance of informal learning in the home; recognising that the prime task of the curriculum is to develop in every child the ability to progressively work things out for themselves; quality education is everything to do with teachers, not much to do with structures, and very little to do with buildings; an incoming government faces a breakdown in trust between central and local government, and therefore a breakdown in trust in democracy. From these action points, the case was made for the construction of ‘all-through schools’ (so successfully demonstrated in Finland from the age of 5 to 16) necessarily well grounded in their communities. JR: This sounds like it was pushing for significant change. JA: The ‘Grain of the Brain’ is now sufficiently well understood to make it obvious that the present system of schooling, by ascribing greater resources and status to secondary schools over primary schools is, quite literally, upside down. Such a ‘whole-system’ solution will require Parliament to instigate a radical, bold and far-reaching overhaul of the respective responsibilities of school, family and community. It is not more money that is needed to transform English education, rather it is to reallocate those funds that are being spent now in ways that should go with the natural grain of the brain so as to radically enhance the quality of education, the life of children and national well-being. JR: So, something akin to the transformation that PISA’s Andreas Schleicher had observed in the Finnish system. I can see how this is challenging stuff, but given that Cummings was so involved in its development, was this the trigger to much needed debate? JA: If only it was! Reflecting back, I can now see that it had been written in a way that 10 years earlier would have immediately engaged the attention of policy makers who would have seen in what was said something of real substance. What I had failed to understand was that by late 2009 the general public had become so disinterested that few could, or would, follow the nature of the argument. In addition, by a horrible quirk of fate, ‘Design Faults…’ landed on Members’ desks the very day that the expenses scandal hit the public headlines, and that general level of distrust has rumbled right on through to the election itself, and beyond. JR: I so well remember that what struck me when we first met was your arguing that unless a society was properly educated then democracy itself was at grave risk. I think I recall that you quoted Thomas Jefferson in saying that, “I know of no safe depository for the ultimate powers of a society but the people themselves; and if we think them not enlightened enough to exercise their control with a wholesome discretion , the remedy is not to take it from them, but to inform their discretion”. JA: Yes, and it can’t be understated. That is absolutely fundamental to a functioning democracy. JR: It seemed to me that then, and even more later, you have been inspired every bit as much about protecting democracy, as you were changing education structures. JA: Yes that is totally right, and is why I found myself so appalled at the systematic way the Coalition government, building on the destruction of the LEAs that had already taken place under Labour, set out to progressively destroy any vestige of genuine local democracy. Graham Clayton described this very well at the end of April 2012 as the ‘alarming democratic void emerging at the heart of our school-system’due to Gove’s establishment of direct control through the use of contract law (rather than statute law accountable to Parliament). Schools that had earlier been maintained by a local authority were invited to make individual contracts with the Secretary of State which would offer them enhanced levels of funding in exchange for central Westminster control. At the same time individuals and groups were invited to establish ‘Free Schools’ that would again draw their funding and their legitimacy from a contract with the Secretary of State. JR: How exactly are these Free Schools ‘free’? JA: Well, the use of the word ‘free’ is critical yet cynical, and I would argue totally misleading. Free Schools were promoted by government as being ‘free’ of what the public had come to understand as the unnecessary, unhelpful, politically-challenging interference in the plans of central government by the LEAs. But they then became totally dependent on the whim of the Minister. The establishment of Free Schools and further Academies has, rather than supporting a democratic ideal, worked to implant self-interest and competition at every level in the education system and undermine the concept of education as for the whole of society. Playwright and poet Alan Bennett was correct in recent comments about private education that equally apply to Academies and Free Schools. He suggested that not only was such privilege unfair, it was “not Christian either… Souls, after all, are equal in the sight of God and thus deserving of what these days is called a level playing field. This is certainly not the case in education and never has been, but that doesn’t mean we shouldn’t go on trying. Isn’t it time we made a proper start?” he asked. JR: And it seems like our political system, certainly in its contemporary form, is not geared towards creating such a level playing field. JA: It’s possible that Cummings’ recent outbursts in the Times (June 16th/17th 2014) are an acknowledgement by him of the damage done in, and to, our political system by his office and those that have gone before. In amongst the trademark political vitriol lies a sentiment that ran throughout our communication – that the current political system is dysfunctional, and that such dysfunction provides profound ‘obstacles to serious government’. Of course in The Times newspaper (and others in the Rupert Murdoch stable), Cummings and Gove have found, or created, something of a cheerleader: Cummings is described as ‘one of the most brilliant minds in Whitehall’, and the architect behind the reforms Gove is given much credit for. But to me, having had him work so closely on the ‘Parliamentary Briefing Paper…’, he is a conundrum. He revels in the power that the unelected, shadowy special advisers have, yet in our dealings I had no reason to doubt his integrity. But the fact of the matter is that Coalition education policy has born no relation to the recommendations in the published version of the Briefing Paper on which Cummings himself signed off. JR: And has any of this come as a surprise to you? Cummings railing against this dysfunctional system, the shift from endorsing your work to policy that undermines it…? JA: Well, we had many long conversations, a number of meals together, and you have seen yourself the detailed comments he fed in to the development of the Briefing Paper. I expected the discussion to continue, to be about best pedagogic practice, but then once him and Gove were in amongst the Whitehall machinery it changed. JR: Why do you think that was? JA: I suspect there were a number of things at play. I think we can’t get away from the presence of great egos in all of this. Cummings, I think, felt he would be able to manipulate the whole system and has actually found that he can’t. In light of this, and simultaneously in the grip of his and Gove’s Messianic vision that only they knew what really needed to be done, they ploughed on: hard, fast and in whatever way was necessary to realise the total destruction of local authority control that they felt so stifled innovation. JR: You would be the first to champion innovation would you not? And maybe to innovate, things need to be done differently, by definition? JA: Innovation yes, but in fact it is the transformation of education that we need in England. What I object to is political innovation that undermines any sense of local participation in the running of schools. If Westminster politicians won’t trust local politicians to take their work seriously, then to replace 140 such elected bodies (LEAs) with the single control of one Minister, then I fear not only for the breakdown in democracy, but also the nature of bureaucracy which would need to exist between one minister and 30,000 separate schools. JR: When put like that John, it sounds like one of those moments where the genie is let out of the bottle and there is no way of going back. Something compounded by a lack of real opposition within the political class to what is happening – local accountability and oversight just isn’t being discussed. JA: Yes that’s right. In fact, it’s not at all clear how the Coalition approach hangs together at all. A very well-placed colleague, Tony Little (the Headmaster of Eton), asked in a public meeting with Gove, how was it that the individual beacons of light (for there have been excellent individual developments through the Academies and Free Schools programme, as well as failures) would illuminate the whole country? In response Gove admitted that he had no answer. There was no assumption, no plan, that all these pieces would come together into a coherent whole. JR: No plan? Once the local authorities have been sufficiently undermined, bypassed and cast as irrelevant, there is no plan for proper administrative oversight? JA: Shocking isn’t it. Deeply worrying. I object intensely to the use of the word ‘free’ in ‘free schools’ – this government is making a major point of schools being free of local authority influence, whilst ignoring that this simultaneously makes them totally dependent on central government’s policies. Yet as we see, no-one is exactly sure what this might mean. JR: And what are the views of those working in the education sector? What do the teachers think, and what can they do? JR: Is this something new, or has that tension always been there? JA: There has always been a degree of that tension, but it has become acute in 2014. I think this is because so many English adults were inadequately educated themselves through the Secondary Modern Schools, or through the Grammar School system which told them that they were already brilliant and didn’t have to worry about doing anything. Deep down, the adult population has no real faith in schools, they fundamentally don’t trust them or the system, and that has been a source of pressure since the 1940s. JR: What do you mean that they were inadequately educated, that they don’t trust the system? JA: Well, the assumption that was made in 1944-45 was that only a quarter of the population were capable of sustained intellectual thinking, and another 10% were considered not as good intellectually, but good at practical thinking. This left 65% deemed to be set for the factory, and that was the assumption behind the theory of intelligence testing and the ‘11-plus’ exam. Within 20 years we realised this was wrong, and so in 1965, with the introduction of ACT10/65, it was decreed every local authority should move to all-ability Comprehensive schools. The problem was that the government initiated this earth shattering reform without having any firm grasp on how exactly to organise a comprehensive school. To be fair it took the Finns, who arguably lead the world educationally today, 20-25 years to work out that if we educate our children properly from the age of 7 upwards, and empower children to think for themselves, then we can get almost everybody to a high standard. But the Finns were able to rely on teachers that were trained and developed to a very high quality indeed, on the basis that every teacher has to be good enough to decide in a variable situation on any given day, what that class needs. The English were never able to do that because we never went for a high enough standard of teacher training, so that in 1965 there was all hell let loose as suddenly every teacher had to be able to teach everybody, of any ability and inclination. Because of this mistake, private education boomed. It was the beginning of the boost of private schools, able to deal only with those people whose parents are so interested in education they will stick by whatever it is the schools decided to do. So, as you go through the 70s you see the politicisation of this which was, we can’t actually attack the grammar schools, but we can attack the direct-grant schools, because they are receiving public money and they are providing the social elite with a route out of comprehensive education… and so, when we come through to the present politics, there are large chunks of society, of the population, who still deep down feel that they have been very, very badly treated, and their parents and their grandparents have been very badly treated, and don’t want to trust the education officers..
JR: So, such distrust across the board politically, must add fuel to the fire of some of these Coalition reforms – there doesn’t seem to be any real opposition, not many alternative voices that can be heard above and beyond the mud-slinging. JA: Yes the present Coalition Government knows that if they challenge, mock or undermine teachers and professional educators then the media and the public will agree, and so this stuff we saw in the Times last week about ‘the blob’ is lapped up, and constantly pushes the line that the professionals don’t know what they are talking about. The level of distrust between English academics and educational policy makers, between parents and what might remain of local authorities in my mind is thrown into sharp focus when statistics from Finland show that public confidence in teachers runs at about 90%, slightly higher than the church and vastly in excess I politicians. It is why some two years ago I was so distressed (see later) we were unable to persuade the BBC to run a documentary on the potential of children’s learning of the kind done, years ago, by Bronowski in ‘The Ascent of Man’. The political assault on teachers has savaged the respect that should be due to children’s education. JR: I’ve been shocked by how confrontational Gove and Cummings have been – and the more anyone in the profession disagrees the more it is spun as proving their point – that the teaching profession won’t embrace change for the good of the children. JA: Politicians are looking for quick fixes, and in quick fixes they would like to override what anybody else has been saying. The teaching professionals are fed up to the back teeth with being continuously ignored, and that’s gone on for so long, and they have been manipulated so much over the years, that they are now nothing like as shrewd or wise in their engagement… they, like the government, go after the first thing that crosses their picture, and set up for battle. It helps neither side, and it certainly doesn’t help our young people. It is a travesty of what public debate should be about, and of particular significance as England approaches a General Election in May 2015. JR: The current animosity does seem to be the latest manifestation of deepening tensions, and doesn’t seem to be restricted to one side of the political spectrum, but has certainly something the Initiative has seen consistently for the last 20 years. And this means there is little or no space for proper opposition or debate. JA: Yes, we can look back to the Downing Street conversation in 1996, that the government are seeking a teacher-proof system. This is incredible. Passionate and quality teachers think this is ridiculous – it just doesn’t work. So it’s really been a struggle between the academic mind looking, not to defend bad practice, but looking to promote new practices which would get to the heart equipping children when they are very young. So I saw a struggle between an old agenda that goes back to Roger Ascham (1567), and indeed further back to Confucius, which tries to find a better way of doing things, but is struggling with a political agenda that says we want to take control of this, and it is all really very simple, we should just tell children what to do, and by the way we want to replace local authority control with big business control. So that’s the story which is underlying the whole thing. JR: This is all immensely complex. Are we in the midst of a ‘there is no alternative’ moment – things are how they are – because although the decisions taken and mistakes made can be analysed it is also difficult to see how things could have been different. JA: This is my frustration! We have to acknowledge that choices have been made, and we can make tough choices to bring about the necessary transformation. We have talked earlier about Finland, and in Finland we have an inspiring and challenging example. Going into World War 2 England and Finland were on a par educationally, but, following the end of the war, our paths diverged. The Finns, heavily defeated, went back to the drawing board, and took a long hard look at the design problems at the heart of their education system. And they reinvented that system. They identified that the key was to have the best teachers possible, and they had the foresight to realise that such transformation would need to be systematic and would likely take 20-30 years. Where the English, as victors, tinkered at the edges, sought only to improve what existed, the Finns set about the radical reconstruction of their education system. The problem we have in England is that Gove and the Coalition have set about trying to radically alter the system in five years flat – in one Parliament – and this has to have been done with shortcuts. JR: With the rise of PISA and other international rankings and comparisons, what are we to make of other countries’ approaches? Are they simply inspirations, or warnings, or in this era of globalisation is there more going on? JA: This is an interesting question. The Finns have been well aware of the approaches taken in other countries, and I argue that Battling for the Soul of Education is an international issue, which is why the Initiative is an international network. Pasi Sahlberg sees an emerging threat to education which he calls the Global Education Reform Movement (GERM), characterised by “increased competition and choice, standardization of teaching and learning, tightening test-based accountability, more data, corporate management systems, undermining or abolishing teaching unions, and merit based pay for teachers.” He argues that, “this is not the best way to improve learning in our schools, and there is no evidence that it would improve the quality or enhance equity of education systems. Finland, forgoing the tenets of the GERM, is a nation that has demonstrated sustained educational improvement since the early 1970s, shown consistent high performance by students, and maintained an equitable educational system at the same time.” This has been achieved by improving the teaching force, limiting student testing to a necessary minimum, placing responsibility and trust before accountability, and handing over school- and district-level leadership to education professionals. So, you can see that from similar starting positions we in England and the Finns have gone in very different directions. Sixty years on Finland consistently comes out top of all the western countries n al the OECD findings ( south-east Asian countries now concentrate even harder on examination results).Currently England is around the mid-20s in these comparison tables, and the politicians continue to embrace American style reform programmes (GERM). JR: I see the influence of GERM not only in the politics shaping English education over the last 10-15 years, but also increasingly in the think-tanks and universities that should offer up alternative perspectives. It strikes me that this has been reflected – at least since 2010 – in how tough the funding environment is. It is incredibly difficult to get funded for anything not already in existence, not proven or not in the mainstream. It seems that the shifting political landscape has been reflected in the funding and philanthropic realm too. JA: There has really been a dramatic change in so-called charitable foundations. When Education 2000 (the forerunner to the Initiative) came into existence, it did so because we had a relatively large amount of money from a number of charitable trusts who felt that the current model of education needed to change. This funding was enough to support the move of the Initiative’s operations to America and the significant Wingspread conferences, the re-birth of Education 2000 as the 21st Century Learning Initiative, and the move back to the UK in 1999. It was money from these sources that enabled me to address up to 100 meetings a year in different parts of the country – people said ‘we’ll fund that because this is very important’. Charitable organisations are, it seems, so constrained these days. The Initiative experienced it most recently with the Dulverton Trust, who insist that every application has to fit into a pre-ordained structure – you have to fit with a certain form and a certain tick-box thing that if you don’t then you can’t even be considered. In the past, almost invariably, I was able to get a meeting with the chairman of the organisation or company, and now it’s all been delegated down the line… and when you are suggesting profound challenge to the status quo, it is hard to get anywhere in this way! We just didn’t fit! JR: And whilst at times you just have to accept it, there have been other occasions where it has been a far tougher experience. JA: The politicisation of funding I suppose is nothing new, but it was not something I, nor the Initiative had had such overt experience of. Another example, and this one really upset me, was negotiations we were in with a charitable trust linked to the entrepreneur Rumi Verjee. There was around a £1 million at stake, and the discussions went on over a year… but after a year it was announced that he was giving about £770,000 to the Lib Dems, and he has since been made a Lib Dem peer, Baron of Portobello. Of course he was cleared of any impropriety, but it certainly hurt. JR: John, I remember that time. It was hard to take and seemed to affect you deeply. JA: It did. Discussions with Rumi had been encouraging, but looking back, I knew the writing was on the wall when out of nowhere he remarked in an email, “I do feel Michael Gove is the best bet. He is very determined and has the ear of the prime minister.” His withdrawal from discussions echoed other experiences that I have had – citing the salience of the issues we raise but that these are almost too big to engage with. It was a great disappointment, and repeated the views of Esmée Fairbairn amongst others. Without being in line with the zeitgeist, the transformation we call for is dismissed as too profound, too difficult. JR: It almost sounds as if these organisations lack the courage or the fight to champion genuine alternatives. JA: And it wasn’t limited to the philanthropic sector. In June 2013, discussions with a publisher and television production company had been on-going for 18 months, and it was looking increasingly promising that we were going to make ‘The Brilliance of Their Minds’ as a six-part documentary series in which the whole story is told in an accessible and challenging way that looks to the examples of Finland and British Columbia, and fronted by Tony Little, headmaster of Eton. We were getting down to discussing the detail of the script and the accompanying book when it came to light that we had been duped. This interest had been to foster an attempt to get the ‘inside scoop’ on Eton. When the programme outline that the publisher and TV producers had been working on in parallel was revealed, it bore no resemblance to what we had written! It was unashamed, behind-the-scenes expose. Nothing more. I could not believe it. The publisher had taken me for a ride, and I was taken in. Of course eventually both Tony and Eton would have nothing to do with this and the project collapsed. Whilst this captures the difficulty in engaging the media and public in debating serious issues it was also a deeply painful event personally, and alongside what had gone before was almost too much to take. JR: I well remember John. It was a shock, and a painful blow. “I guess nobody other than myself knows of the pain that a number of responses similar to Rumi’s have caused me over the years. I put ‘my all’ into pushing people to understand why the Initiative needs help. In doing so I expose my inner self. I just don’t think I have it within me to go after another sponsor for fear that that, too, may prove a wild goose chase. So, for the first time ever in 26 years I am finding myself wondering how to draw this all to a conclusion… but by when I don’t really know. The tension this creates is horrible. But of course, this story doesn’t end. The Initiative has over its lifetime developed and been supported by an astounding array of individuals and organisations around the world. How children learn, and how we bring up our young people are the most profound questions we, as a society, must grapple with. Even if our political masters offer only dead-end and diatribe, these questions keep nudging away at every parent, grandparent, young person, everyone engaged in their community, business, the arts. These are profound questions of what it means to be human, and who we, in the 21st Century are becoming. We are talking about the world we want to leave our society’s grandchildren. So rapid has been the collapse of social capital that an increasingly individualistic culture is robbing communities of that which once gave them their vitality and made their pavements, town squares and backyards the locations for intergenerational discourse. It was here that children learnt intuitively and spontaneously the interdependence of learning, to working and living. It is social capital, not institutional arrangements, that bind people together in their daily lives, and which is so essential in the future. The way we are treated while growing up largely determines the way in which what we are born with turns us into what we are. It is the combined influence of home, school and community (not formal schooling alone) that creates men and women capable of doing new things well, not simply repeating what earlier generations have already done. Quality education is everything to do with teachers, not much to do with structures and very little to do with buildings. Productive teacher-pupil relationships are based on explanation, on talking things through, and seeing issues in their entirety. To achieve this teachers need both technical subject knowledge and considerable expertise in both pedagogy and child development, combined with the avuncular skill of brilliant story-tellers. As children grow older and more independent the influence of families and teachers decreases, while the influence of peer group and community increases. Appreciating the evolutionary significance of adolescence demands that communities provide far more opportunities for young people to extend their learning in a hands-on manner, either as formal apprentices or perfecting their skills by working alongside members of the community beyond the classroom setting. Current research in the learning sciences shows the critical need for young learners increasingly to work things out for themselves and become less dependent upon teacher-moderated instruction. This demands a reversal of the current policy which allocates more funds to the education of older children, resulting in the largest class sizes being in the earliest years of education, and the smallest at the top of secondary education for 17 and 18 year olds. These older students should have been empowered by their earlier experience to better manage their own learning, without so much dependence on teacher input. The transition from primary to secondary school at the age of 11 frequently inhibits many bright pupils who are unnecessarily held back, and damages late developers who are promoted when not yet ready. It should now be possible to help the majority of young people, rather than the gifted few, become successful learners who will then relish the challenges and opportunities of the 21st century. There is now enough evidence about how effective human learning takes place, and internationally there are examples of all this at small scales, that new models of learning can begin to be discussed and debated at the highest political levels. For such models to emerge the whole system must be changed significantly, and such change is not likely to happen of its own volition. By progressively ‘front-loading’ the system (the reversal of the present upside-down system of funding), and fully involving the voluntary contribution of home and community (so reversing the inside-out part) this would result in young people being infinitely better educated, far more able to stand on their own two feet, and more responsible for their neighbours, at no more expense than at present. 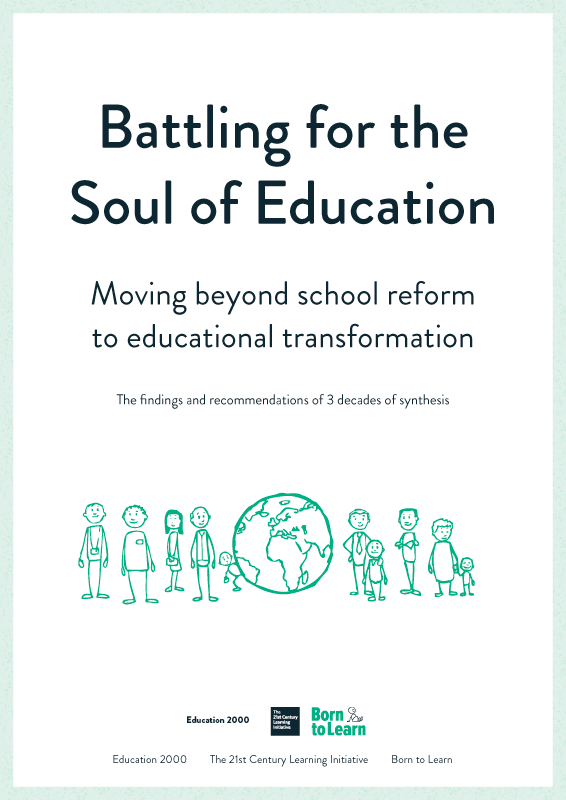 The measure of the ultimate success of such a transformation would be a national recognition by all that it is the community which has to be the unit of education, not – as is currently seen to be the case – the individual school. Focusing on the structures of formal education alone will not lead to successful long-term solutions. It will only be in those communities in which school, home and community are really truly connected that civil society will best operate, and where children will learn from the nursery the value of that interdependence. The first is the possibility to influence the agenda of the Bath and Wells Academy Trust to put research into human learning at the very heart of what it is about. Separate to this, there are three other possibilities. Most exciting of these is that Tony Little has just set up a meeting by suggestion with Pekka, the Special Attaché at the Finnish Embassy to explore how to give substance to the expressed wish of the Finnish Broadcasting Corporation to make a series of television documentaries about the future of education, stressing the early connections between the rigorous and liberal tradition of English schools such as Eton, with the generality of Finland. Then there is the interest of St George’s House Windsor to make ‘Battling for the Soul of education’ the central theme for a major St George’s House Consultation, to be held as soon as possible after the next election – in mid-June. St George’s House would seek to make the Consultation one of their flagship projects. Thirdly there is interest from British Columbia mirrored by the interest from Australia and those people seeking to get behind the significance of the OECD’s statistics – people such as Michael Fullan, and Howard Gardener, who is currently so concerned that America appears to have thrown in its lot with a right-wing agenda seeking to privatise all schools. So, what will happen? This is where things stand in early August 2014, a month after the British Prime Minister replaced Michael Gove as Secretary of State for Education. It is the middle of the summer holidays. It is too early to know which way things are going to go, but with an election due in May next year, the next 12 months are going to be critical. This is not the final chapter, but a summary of a situation that could be used by those with the relevant authority to better shape the agenda for the future in various parts of the English-speaking world. John Abbott is Director of The 21st Century Learning Initiative, a transnational association of educational researchers and practitioners committed to facilitating new approaches to learning which draw upon a range of insights into the human brain, the functioning of human societies, and learning as a self-organising activity. It was established in Washington DC in 1996. Following a long career as a teacher and head teacher in England, John became Director of the Initiative’s forerunner Education 2000 in 1985, spearheading nine community-wide education projects in the UK. He lectures around the world on new understandings about learning, and has advised USAiD, the UN Education Development Agency, and the Canadian Council on Learning. His most recent book is Overschooled but Undereducated. This was written during June and July 2014, just before the Cabinet reshuffle that saw Michael Gove replaced by Nicky Morgan as Secretary of State for Education. See ‘Battling for the Soul of Education’ – appendices – for a more detailed account of English education in the 20th Century.